ROV Ventana comes with two manipulators as standard equipment: a Schilling T4, seven-function spatially correspondent arm, and a seven-function Schilling/Oceaneering Atlas Hybrid (rate and spacially correspondent.) Both manipulators can use a variety of end effectors. The forward-looking camera sytems are mounted on pan-and-tilt units. The main viewing camera is a High Definition Insite Zeus Plus and is mounted in a three-axis pan-and-tilt that is capable of plus or minus 45 degrees of pan and +45, –100 degrees of tilt. Two forward looking cameras, a wide angle Insite Aurora and an Insight Orion Zoom, are mounted on a single two-axis pan-and-tilt above the main camera with a range of 270 degrees of pan and 120 degrees of tilt. The vehicle also has a hydraulic swing arm that deploys from the port side. This can be used to deploy additional samplers, tool packages, safety apparatus or user-supplied equipment. Ventana is equiped with a Sea-Bird 19plus V2 CTD package which includes a dissolved oxygen sensor and a transmissometer. Three spatial lasers are mounted on the main camera for quantitative calculations. 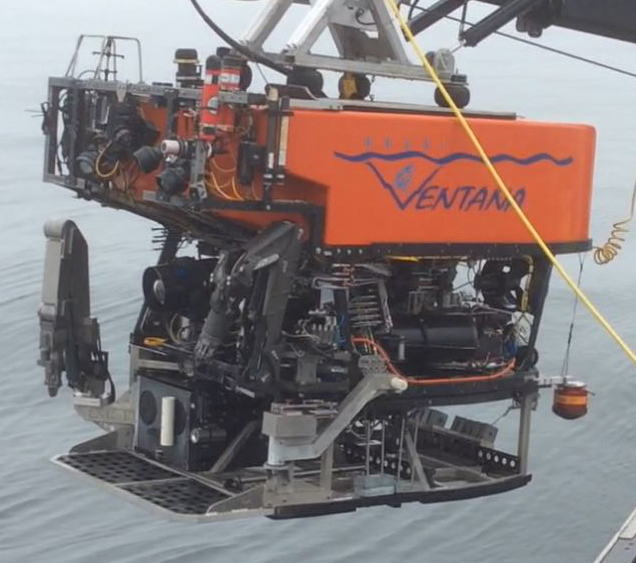 When configured for benthic work, Ventana carries two manipulators, a sample drawer, which can be sectioned off into separate compartments, and a quiver of 20 14-inch push cores. Also incorporated in the toolsled is a suction sampler, which can be used to collect benthic animals in 12 selectable containers. Payload of the system in this mode is approximately 410 kg (900 lbs.) The system is capable of deploying packages up to 113 kg (300 lbs.) using the manipulators. These packages include self-contained time-lapse video cameras, environmental study packages, flow measurement systems, in situ clathrate experiment rack, data loggers complete with borehole instruments (siesmometers, tiltmeters, osmotic sampler), transponder beacons, S4 current meters and many other small benthic experiments. In the midwater mode, the vehicle has the ability to carry up to eight detritus samplers, which are low-impact collection devices. The midwater toolsled carries a suction sampler with 12 isolated selectable collection containers. Interfacing user equipment to Ventana is an easy task. Electrical connections are made using a Seacon MIN-K-10-CCP. This connector contains most of the required interface needs: serial communication, +24 VDC, +12 VDC, 120 VAC, and video connections. Three such ports are available. If custom connections or voltages are required they can be accomodated on fairly short notice. Hydraulic connections are made via quick disconnects and are available at two separate levels: 800 psi from a controllable four-way valve and 3000 psi through a servo valve. R/V Rachel Carson is a multi-purpose vessel for MBARI's remotely operated vehicle (ROV) Ventana, autonomous underwater vehicle (AUV) operations, and conductivity, temperature and depth (CTD) sampling.